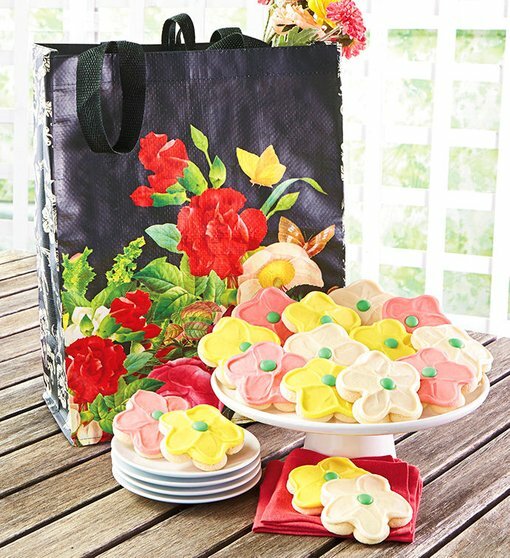 If you browse our Mother’s Day collection online or in our catalog, you’ll see a number of really special gifts that will keep on giving long after the cookies are gone. You might know immediately which one will resonate with your Mom, but if you need a little help, we’ve compiled a list of all the ways she can use her keepsake for years to come. 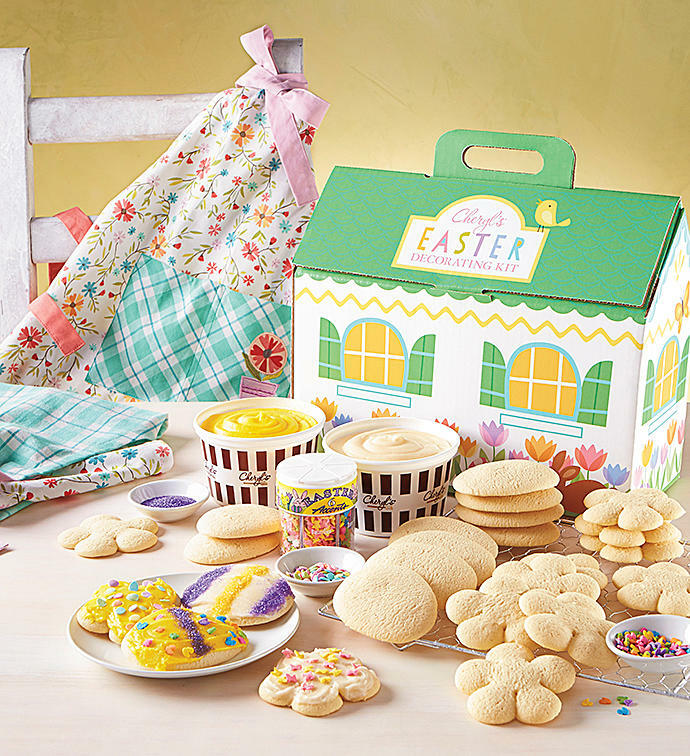 Our busy bakers are hopping to it in our kitchens, whipping up everything you need for Easter. From baskets to buffets, when you’re ready to start to planning, start here. They’re back! 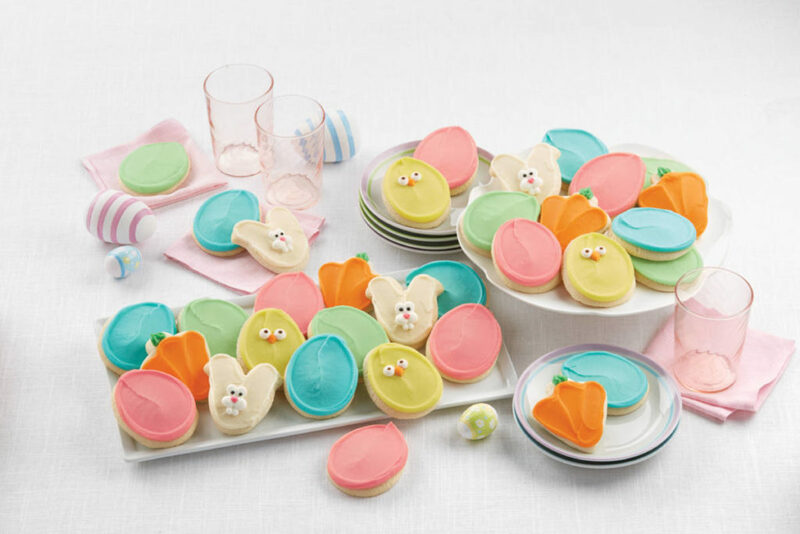 Our adorable buttercream-frosted Easter cookies in pretty pastel colors put a little spring in everyone’s step. Buy them individually wrapped and packaged in boxes of 12 to 200 for place settings, quick desserts, office treats or basket stuffers. 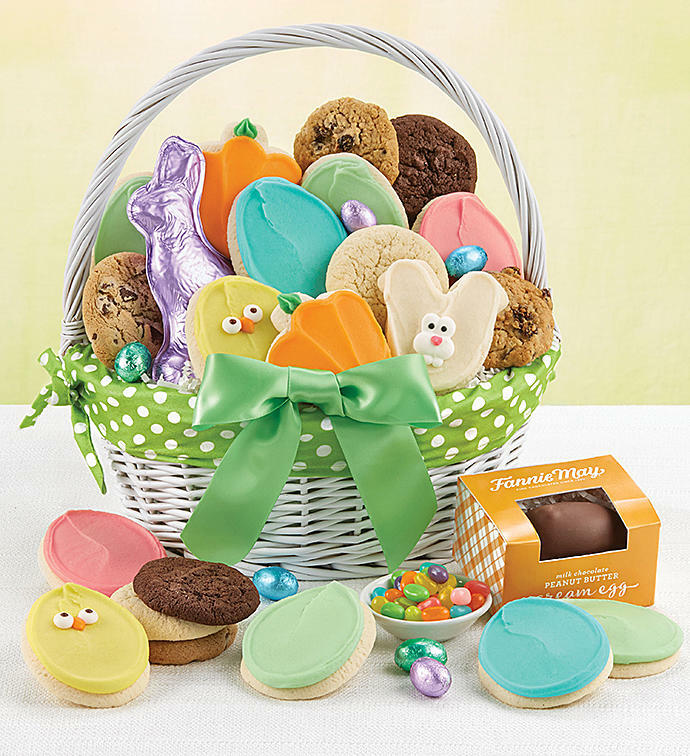 Or send them to loved ones near and far already packed up in our Bunny Cookie Jar, adorable Egg Carton, Ceramic Basket, or felt Easter Bunny Tote. If you have neither the time nor the inclination to create your own baskets, worry not; we’ve got dozens of gifts already perfectly put together, ready to ship wherever you want to send happy wishes. Some come with candy, others with cookies only, but all of them are beautifully presented and sure to delight. Every year, we make a few Easter gifts we know kids will especially like. 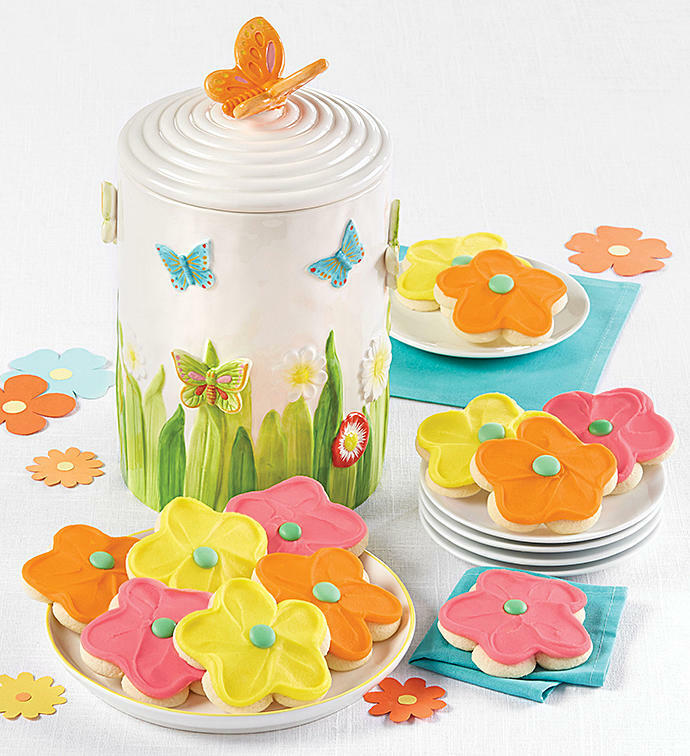 Creative children or those who like to be in the kitchen will love our Easter Cut-out Cookie Decorating Kit. It comes with two dozen already baked egg- and flower-shaped cookies, two one-pound tubs of vanilla icing, and pastel sprinkles. 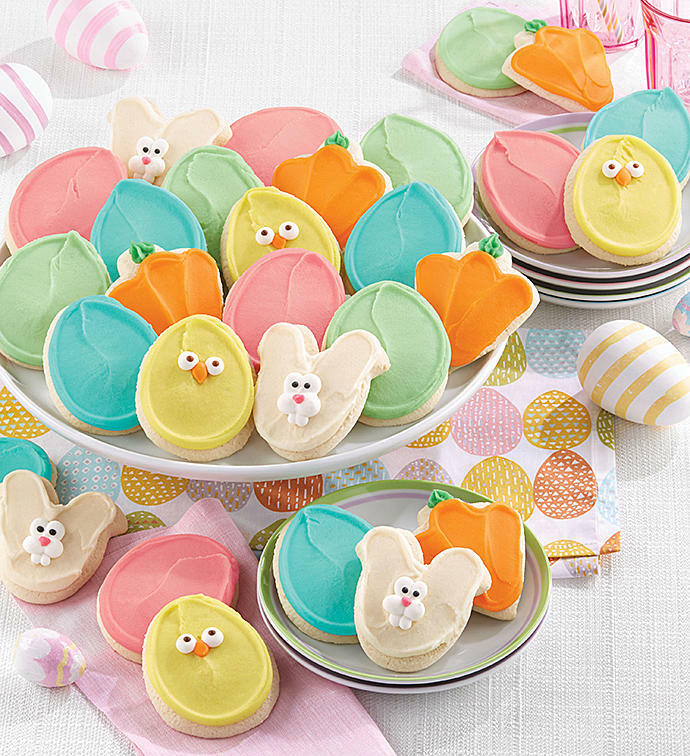 Trust us when we tell you this is way more fun, more delicious, and easier than dying eggs! For kids who are begging for a bunny, we have two baskets complete with a plush rabbit that’s much easier to take care of than the real thing. And if you have lots of little peeps to satisfy, our little Easter Gift Tins are just the right size and are easy to ship near and far. WHAT GOES BEST WITH BUTTERCREAM-FROSTED EGGS? That’s the question we ask ourselves before planning every holiday dinner, and Easter is no exception. 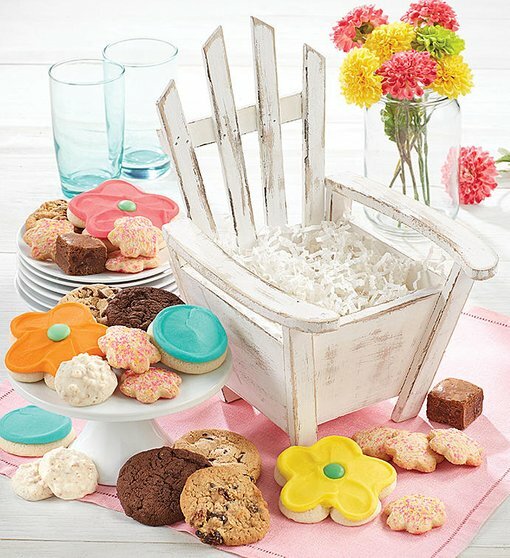 We have perfectly sized cookie boxes and baskets for gatherings large or small, so dessert’s a no-brainer; all we have to do is figure out what comes first. These crispy little spring potato nest cups are the perfect way to start your spring mornings. 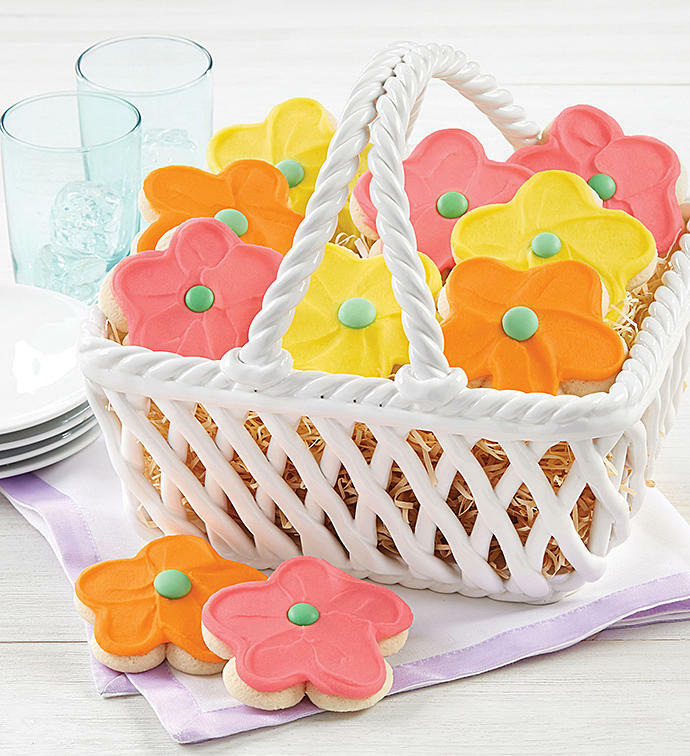 Not only are they a spring favorite, but they also make the best addition to your Easter brunch! Lightly grease a mini muffin tin or tins (32 to 36 cups). Gently toss shredded potatoes with salt and pepper. Place one heaping tablespoon of shredded potatoes into each muffin cup, and gently press into bottom and up sides to bring edges just above the rim of the cup. Bake for 25 minutes or until nests are golden brown. Cool in pan(s) for 10 minutes, then carefully remove and place on a paper towel-lined baking sheet. Filled as desired & enjoy! The holiday season is upon us, and we can practically smell the aroma of fresh baked cookies wafting through the air. Beyond being a delicious holiday treat, Christmas cookies are part of many family traditions, and have a rich history to boot! If you’ve ever wondered why we bake certain cookies each season, or why we leave the good stuff out for Santa, it’s time to enroll in Christmas Cookie History 101! Before you rummage through your kitchen cabinets for your favorite cookie cutters and baking supplies, indulge in these five fun facts about Christmas cookies! The practice of putting out cookies for Santa began in the 1930s during the Great Depression when parents were trying to instill a sense of thankfulness in their children. Leaving goodies, perhaps in sweet cookie jar from Cheryl’s, continues to be a small way of sharing the holiday bounty. Some families even extend the giving to the storied animals, leaving carrots or apples out for Santa’s reindeer! When unusual aromatics like nutmeg, cinnamon, and ginger became more widely available in Europe in the Middle Ages, they were put to good use at holiday baking time. It became traditional to combine butter and sugar—which cost a pretty penny back then—with these prized spices once a year at Christmas. Bakers today include nutmeg and molasses in holiday desserts, particularly in gingerbread cookies—one of the most widely baked seasonal treats. 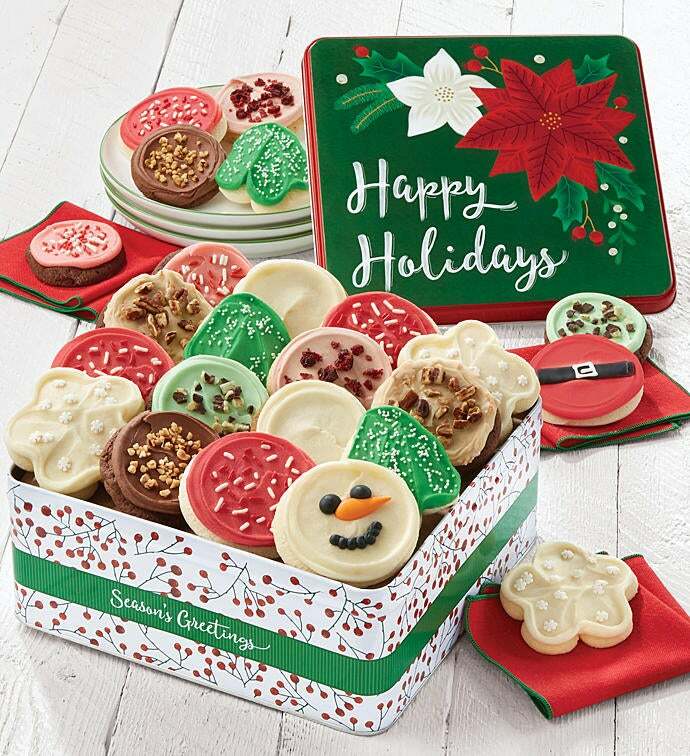 Cheryl’s includes this popular variety in the assorted holiday tin! Along with gingerbread, simple sugar cookies have become another staple on Christmas dessert trays, a tradition that started in the 1700s. At this time, German settlers in Pennsylvania may have brought over the traditional unleavened, easy-to-store treat from Europe. Pliable sugar cookie dough is easy to roll and cut into shapes, which adds to its popularity at Christmas time today. Whether you spread thick pastel layers or use a delicate white glaze on your cut-outs and gingerbread, Christmas just isn’t the same without lots of frosting (or icing, depending on where you live). Decorating cookies with frosting began in the 1600s with a mixture of sugar and egg whites that topped cakes; once cooled, it looked just like ice. 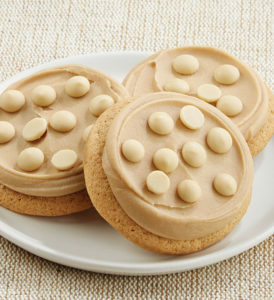 Today, the buttercream variety is very popular, and can be found on Cheryl’s frosted cookies in every holiday shade. Cookies have long been molded and shaped, but using cutters likely began after Queen Elizabeth I decided she wanted gingerbread specially made to look like her honored guests. Tin cookie cutters made stamping out little men easier (and faster), though later these tools were made from aluminum, plastic, and copper. 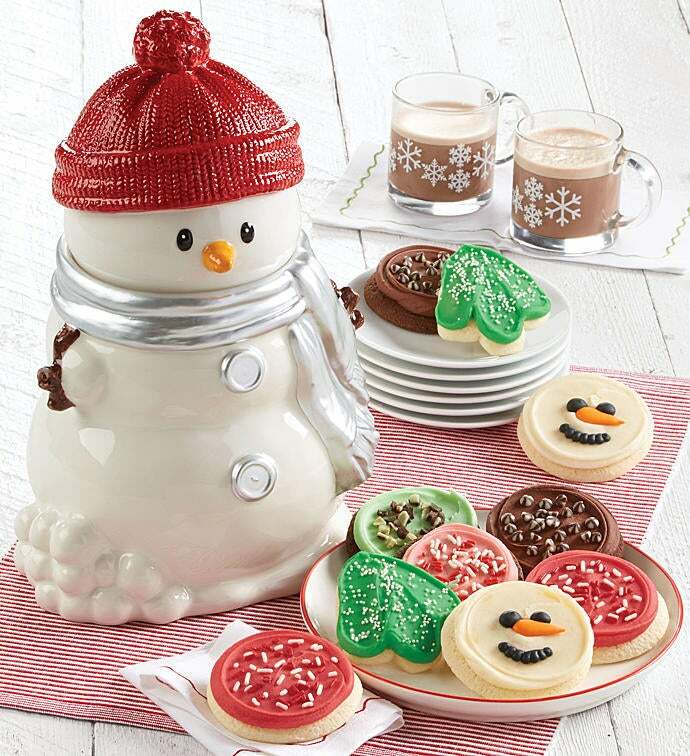 Today, many families have an assortment of seasonal cookie cutters and look forward to using them at the holidays. Reading about Christmas cookies is a good start, but you should really enjoy some first hand to further advance your studies. 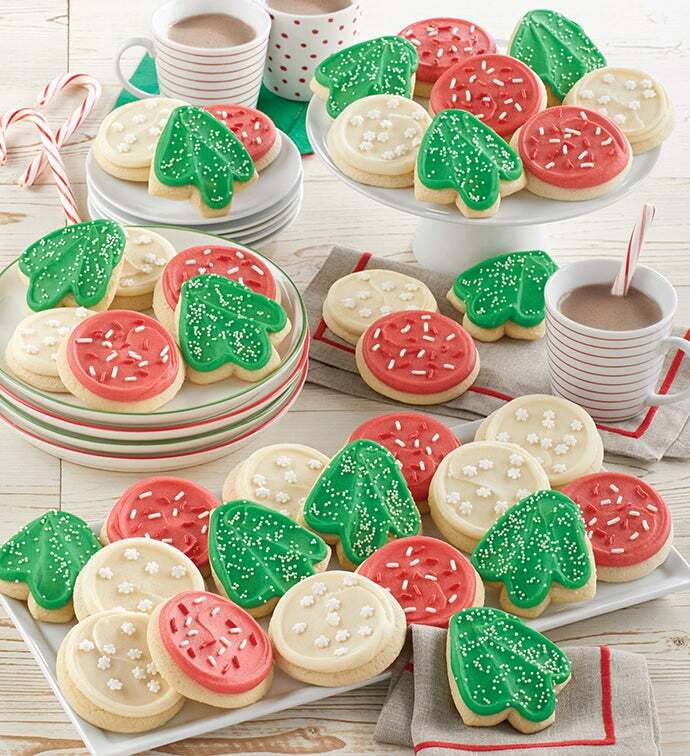 Fire up the oven with these Christmas cookie recipes, or check out Cheryl’s wide assortment of holiday cookies and treats for a truly educational experience! As the weather cools down, our ovens warm up! Read on for recipes, tips and info on our new fall flavors. There are certain flavors that just scream “fall” and they’re not ALL pumpkin spice. Our bakery chef and her team have whipped up five scrumptious autumnal cookies that you’ll want to keep in your cookie jar for parties, after-school snacks, quick-and-easy desserts, tailgating and more. 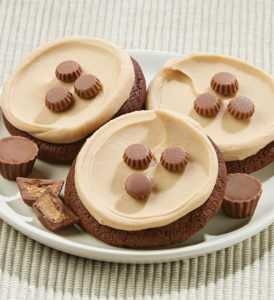 Loaded with chocolate chips and mini peanut butter cups, these rich chocolate and peanut butter cookies are topped with peanut butter buttercream frosting and even more peanut butter cups. Want something a little denser, and ooey-gooey-er with the same great flavor as out Peanut Butter-Frosted Buckeye Cookie? 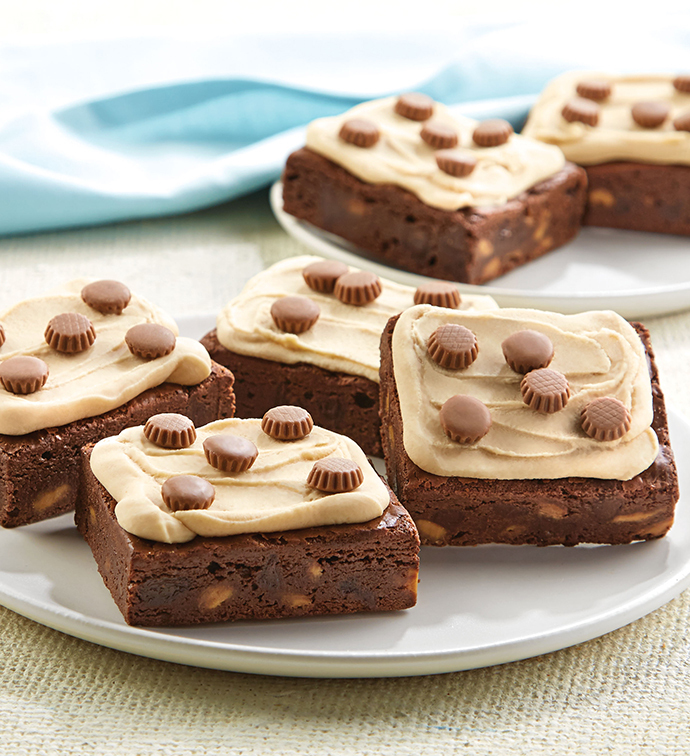 Our brownie of the same name is also topped with creamy peanut butter buttercream and mini peanut butter cups, but has that fudgy, luscious texture only a brownie can provide. Our autumn-inspired cookie batter is made with real maple syrup, and baked with premium maple-flavored white chocolate chips inside. We frost the finished cookies with creamy maple buttercream and sprinkle with more maple chips. The result is a soft and tender cookie with just a tiny bit of toothiness. We say, when you can’t decide, have both. Our “brookie” features a rich, chocolate chip-laden fudge brownie topped with a chewy chocolate chip cookie. It’s two desserts in one! 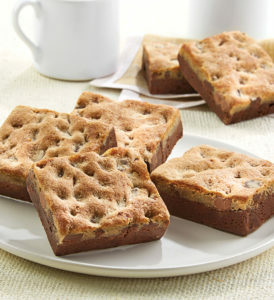 The base of this indulgent treat is a fudgy chocolate chip brownie. We top it with a layer of pumpkin spice cake, then finish it with a sprinkle of raw sugar for sparkle and sweet crunch. A true original! A boo-tiful sight to behold. By the time you’ve gotten the costumes and the candy ready, the last thing on your mind is the table for the trick-or-treat after party. No worries. We’ve got you covered. 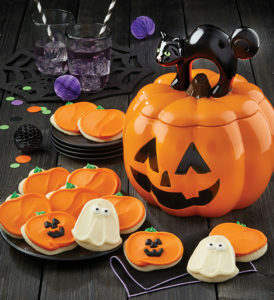 Our Halloween Cookie Jars not only come with delicious cookies inside, they also make great party table centerpieces. Just set one down in the middle of the table, put out the cookies and some cups or mugs, and you’ve got everything you need. Don’t want the kids to dive into the candy the minute they get home? Give them something better to do. 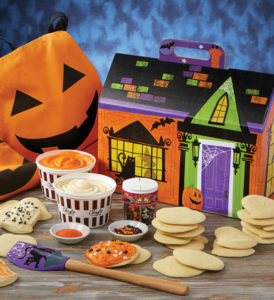 Our Halloween Cut-out Cookie Decorating Kit is a fun party activity with sweet rewards. Orange + Purple = BLACK. For a quick and creepy punch everyone will love, add one package of orange powdered drink mix and one package of grape powdered drink mix to one liter of ginger ale and stir. Then add three quarts of cold water and two cups of white sugar, and add ice. Here are some great recipes from our bakery chef! In a food processor, mix broken pieces of the Maple White Cinnamon Cookies and water. Blend until you can form into a ball. Slowly add more water if needed. Scoop dough into balls that measure approximately 1 ½” and place on a tray lined with parchment paper. Freeze for 1 hour. While the truffles are firming up in the freezer, melt the white chocolate wafers according to the directions on the package. Dip each of the firm truffles in the melted white chocolate, using a fork to allow excess chocolate to drip back into the melting bowl. Place the enrobed truffle back on the tray. Place completed truffles in the refrigerator for 1 hour or until completely dry. Roll each thawed doughball into granulated sugar. (340 degrees for 14 minutes). Remove from the oven and place an unwrapped Hershey kiss in the center of each warm cookie. Let Cool for 20 minutes on cooling rack. Remove from the oven and add in a single buckeye into each cup. Allow 20 minutes on cooling rack before serving. As far as we’re concerned, red, white and blue are the colors of summer, and not just for the fourth of July. The grocery aisles and farmer’s markets are loaded with strawberries this time of year. 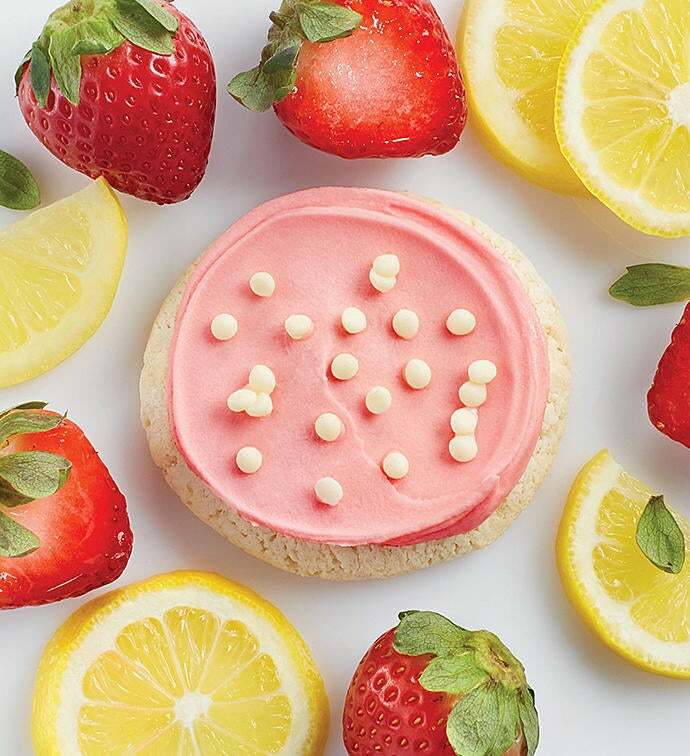 We blended them with buttercream to frost our zesty lemon sugar cookies (made with real zest and sweet lemon chips), but we still can’t get enough. Here are just a few other delicious ideas for the season’s best berries. 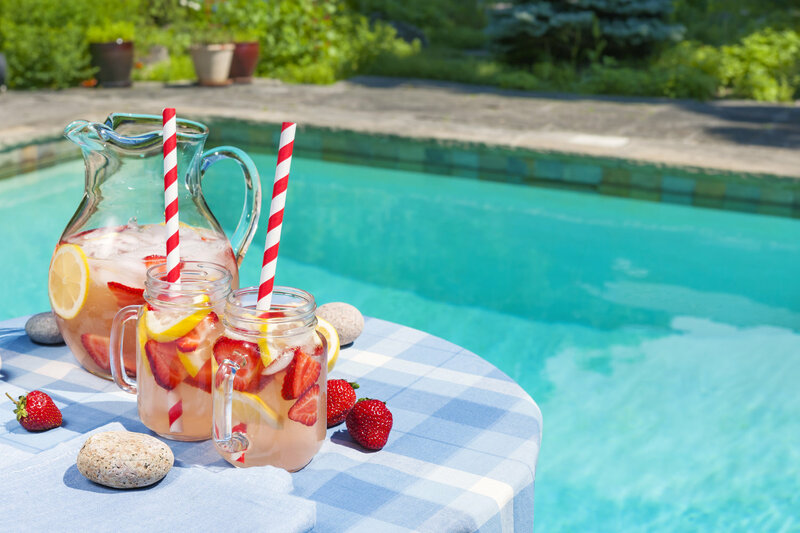 Give your favorite lemonade recipe a little kick by adding a super-smooth puree to the pitcher. Simply blend eight large strawberries and two tablespoons of sugar together in a high-speed blender, then add one cup of water and blend until smooth. Add the puree to six to eight cups of prepared lemonade, and enjoy. Vanilla ice cream and sliced strawberries topped with our thick and glossy hot fudge is the best summer sundae ever to tickle your tongue. Move over buttercream, there’s a new buttery topping in town…this time it’s mixed with cream, brown sugar and honey for a sauce that’s better than fireworks! In a small saucepan combine butter with heavy cream, honey, brown sugar, and cocoa over medium heat. Once everything has melted, remove from heat and stir in chocolate chips, a dash of vanilla, and just the tiniest pinch of salt. You can keep leftovers (if you have any) in the refrigerator for a month or so. 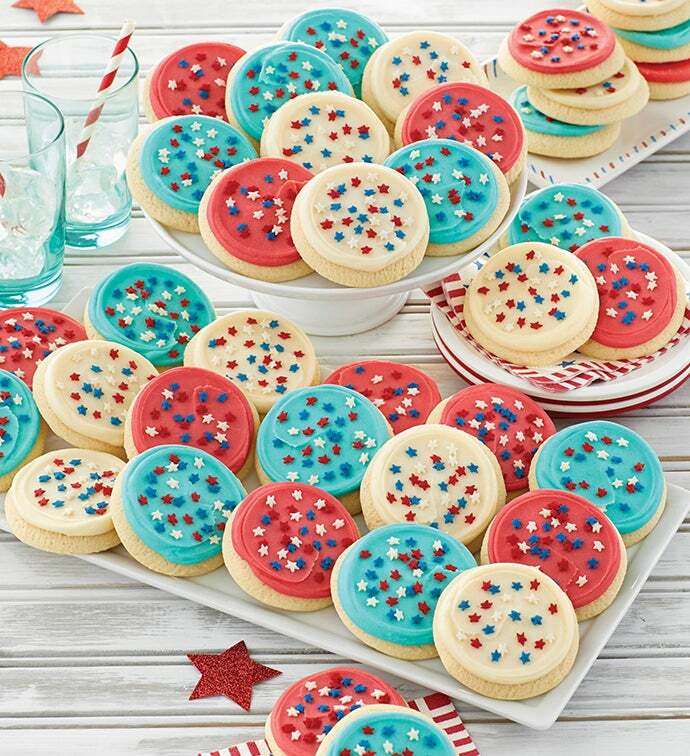 The fourth comes and goes, but our patriotic cookie collection lives large all summer long. Frosted in red, white and blue buttercream and sprinkled with stars, they’re ideal for all sorts of seasonal celebrations. One of our favorites! Invite friends over to lie back on the grass and take in the constellations you can most easily see in the Northern Hemisphere. Start by locating Polaris, or the North Star, which consistently stays due north. You can find Polaris by identifying the Big Dipper, locating the two stars that make up the end of the Dipper where the water would pour out, and then imagine the water running straight down. The bright star at the end of the imaginary stream is Polaris. Another fun star grouping is called The Summer Triangle, made up of three stars named Vega, Deneb and Altair. To locate them, face south. Vega is the brightest star you’ll see if you look east (to your left). Deneb is the second brightest to your lower left, and Altair the faintest to your lower right. Once you’ve found all three, you can identify the constellations associated with them: Lyra the Harp, Cygnus the Swan, an Aquila the Eagle. It can be fun to see who can make out the constellations first, and even more fun to end the evening with star-studded cookies and sparkling water or wine. 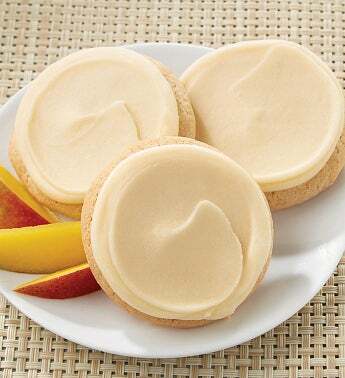 We wouldn’t do it every day, but we highly recommend our seasonal Mango Cookies for…breakfast or brunch. Made with butter, mango preserves and sweet, chewy bits of real mango they’re delicious as a sweet side to a tropical fruit plate with coconut yogurt. AND REGRETS SHOULD BE FEW! The days may be longer, but the season always goes too quickly. This summer, don’t miss a single cookout, picnic, clambake, day at the lake, or backyard barbecue…and always remember to bring cookies. Because life’s too short to pass up dessert. The entertaining season is upon us, and when you make Cheryl’s part of the party, you’re guaranteed to become known as the host(ess) with the most(est). This year, go beyond gifting and make Cheryl’s part of your own personal holiday get togethers. Whether you’re planning a big soiree or an intimate family gathering, we promise to help make it a stellar celebration. 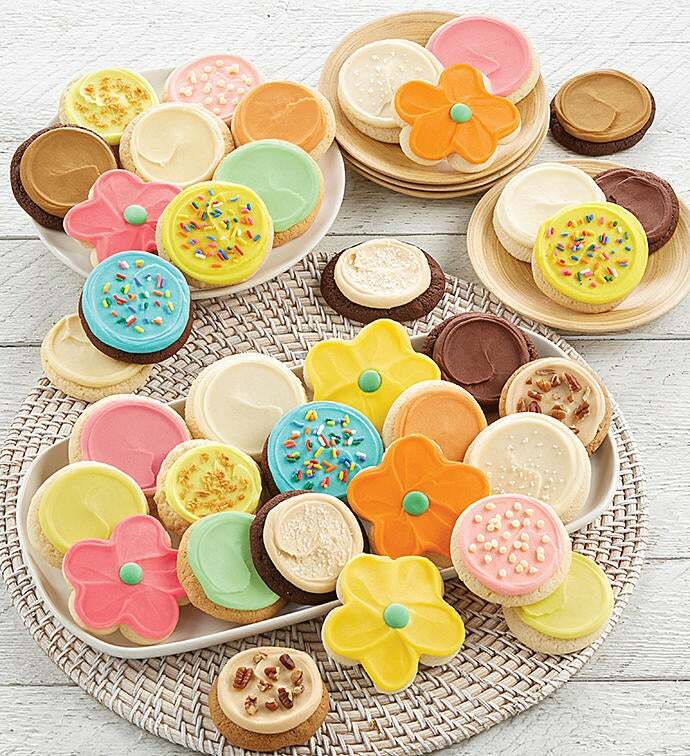 All of our Buttercream-frosted cookies come individually wrapped, so they work beautifully as party favors. We love the idea of setting one at each individual place at the table. You can even make them do double duty as place markers by attaching a small name card to each. (For a more dazzling presentation, place one of the treat-filled tins in our Christmas Tree Tin Set on each plate and get ready for a tableful of “oohs” and “aahs”. We originally created our Holiday Cut-out Cookie Decorating Kit for kids, but we’re continually tickled to see how often it’s the grown-ups who have the most fun. This year, instead of the expected cookie exchange, why not host a “most creative cookie contest” for young AND old. You can ask everyone to bring their own favorite edible decorations to add to the white and green icing and holiday sprinkles included with the kit, and see what kind of fabulous creations arise. You can add a little spice to the party by including our little Gingerbread Cookies as well. They’re really fun to decorate using small tubes of decorating icing from the grocery store, and since one tin comes with approximately 25 cookies, you can have as many people as you want join in the fun. And if you like your parties lively, consider picking up our Snowball Fun Kit as well. You can lob the soft stuffed snowmen at each other while making culinary magic. WHAT TO SERVE AT A BIG SHEBANG! Whenever people look at our great big gift baskets, they immediately think, “Wow! That’s the kind of gift I’d give to someone really special!” Allow us to offer you a second thought—one that goes something like this: “Wow! That basket has 186 cookies, brownies, muffins, and pecan butterballs…and the presentation is gorgeous. That would be a great way to handle dessert at my big holiday buffet/open house/family dinner celebration.” Best of all, since everything’s individually wrapped, you can either send leftovers home with your guests or freeze them for later. (All of our baked goods freeze beautifully!). How do you give thanks? There’s no better time than Thanksgiving to count your blessings, show your appreciation, and send wishes to the people who make your world a little bit warmer. Whether they live with you, across the street, or across the country, Cheryl’s is committed to making it easy (and delicious) to say thank you to everyone on your gratitude list. If you want to celebrate a big group of people or one special person in a big way (college students love to share! ), our 100-piece Fall Frosted Cookies Gift is the best way to do it. Chock full of seasonal flavors like Butterscotch Chai, Salty Caramel, and Mocha Latte, all topped with our classic buttercream, it’s guaranteed to delight every last tastebud. Show EVERYONE you care about how much you appreciate them with a card and a cookie. Costing only a tiny bit more than a paper greeting card, our cookie cards are a lot more fun and guarantee a smile. If you’re sending them to loved ones far away, you might want to personalize your cookie with a family photo and a special note, just to let them know how much they’re missed. We love the idea of keeping the giving going. Our Giving Plate comes painted with a charming message that encourages the recipient to fill it back up and send it along with new treats. It’s a great idea for large extended families or special groups of friends; each Thanksgiving the past year’s lucky recipient can refill it and send it to someone else in the group. It’s always fun to try to guess who will be next on the list! We know a family that uses their cookie jar to hold “Gratitude Slips”—little pieces of paper on which they write the things they’re grateful for throughout the year. Then, after Thanksgiving dinner, when everyone is happy and full, they bring the jar to the table and everyone takes turns reading the past year’s gratitude slips out loud. We loved their idea so much, we wanted to suggest it to you. This year, why not buy your family one of our Fall Cookie Jars, enjoy the cookies inside for a Thanksgiving party or dessert, and start your own gratitude slip tradition? Go BOO or go home! It’s official: Halloween has grown to become America’s second-favorite holiday! 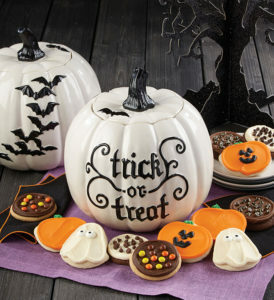 Whether you’re staying at home passing out treats, planning a full-out party, or just wanting to send a tempting treat to friends and family far away, we’ve got ways to make the holiday spookier in the sweetest way possible. IT’S MY PARTY AND I’LL FLY IF I WANT TO. Are you a good witch or a bad witch? You’ll definitely be the former if you don one of our festive Halloween aprons and whip up a batch of delicious brew in your cauldron. We love a blend of cranberry juice, ginger ale and apple cider kept cold by an icy hand. To make, fill a rubber or latex glove with water, make a knot in the end, and freeze. When solid, cut away the glove and place in a punch bowl with 2-1/2 cups of cranberry juice, 2 liters of ginger ale, and 2 liters of non-alcoholic apple cider (we like sparkling cider best). FOCUS ON THE COSTUME, NOT THE COOKING. Of course, if you love to cook, go right ahead. But if you’d rather spend the day of your party perfecting your makeup, altering your costume or finding the best way to apply fangs and fake blood, we’ll happily step in and supply the goodies you need to make your guests feel well treated. We love a celebration that keeps on giving, and Dia de los Muertos or the Day of the Dead lets us (and you!) do just that. Originating in Mexico and taking place on November 1 & 2, the Day of the Dead is believed to occur when the gates of heaven open at midnight on October 31 and the spirits of the deceased are allowed to reunite with their families and be honored by them for two days. At the heart of the Dia de los Muertos festivities are the brightly decorated folk-art sugar skulls made in special molds. We’ve created our own take on sugar skulls, decorating our buttercream-frosted cutouts in the same happy style. This year, why not extend your Halloween for a couple of days and enjoy celebrating loved ones who are perhaps gone, but never forgotten. It’s a daily challenge for moms and dads everywhere: coming up with quick and easy lunchbox ideas that you kids will actually eat. And while you’d love to wow your tots with a Pinterest-worthy spread, you don’t always have the time to make that cute bento box meal. To the rescue: these fast and fun ideas for your kids’ lunches that will be the talk of the cafeteria. Ho-hum, another PB&J. Kid and parents alike love sandwiches—they’re tasty and fast to make and the ingredients are usually on hand in the pantry or fridge. But instead of presenting a square turkey and cheese, why not cut it into an adorable shape? Yup, dust off those Christmas cookie cutters and give them a new job. Stamp out stars, hearts and trees—and then watch your kids gobble up lunch. And as a special treat, you could add a Happy Day cookie card from Cheryl’s. Those old spaghetti sauce and Mason jars in the drawer can be put to good use at lunchtime. And because the packaging is clear, your kid can see the colorful (and delicious) layers you’ve designed. Gather your child’s favorites and then create a masterpiece. For example, you might start with a black beans on the bottom, then add shredded lettuce, grated cheese, a few sliced tomatoes, chunks of avocado and crumbled tortilla chips. The result? A taco jar lunch! Why pay $4 for a tiny box of ham and cheese when you can craft your own for much less? Plus, you can up the health factor over the premade grocery version by including fruits, veggies and meats with less salt. To make your own, roll up slices of ham or roast beef along with Swiss cheese and nestle them in a plastic container. Add in a few cucumber rounds, a small bunch of grapes and a buttercream frosted cookie for dessert. Bon appetit! You can’t exactly send marshmallows on a stick to school, but you can definitely deconstruct your kid’s sandwich (or leftovers) and then skewer it for his lunch box. Bamboo sticks used for grilling or regular toothpicks will work well. To make lunch on a stick, thread pieces of cooked chicken, a cube or two of Feta, chunks of watermelon or a couple of strawberries. It’s time for a Flat Sammy! No, not Stanley—we mean sammy, as in sandwich. Switch up your kid’s usual bread choice by replacing it with a flour or corn tortilla. You can layer quesadilla fixings quickly, brown in it a small skillet and then wrap it in foil for lunch. Filling ideas are endless, including leftover pork with Jack cheese and salsa or mashed kidney beans with cheddar and sour cream. Don’t forget to include a side dish or snack in your kids’ lunch—it’s a long day! Alongside the ideas above, toss in a bag of edamame with sea salt, some trail mix, or celery sticks spread with cream cheese and topped with nuts or raisins. In 1984, ice cream finally got its due respect: July was declared “National Ice Cream Month!” While we certainly don’t limit our ice cream intake to one month, what better excuse to have a few extra scoops? While there’s certainly no shame in grabbing your favorite flavor or ice cream creation at the store, why not get creative to honor the occasion? Here are four delicious ice cream recipes to liven up July’s best moments. Who doesn’t love creamy, cool ice cream sandwiches on a hot summer day? They’re made all the better when you take your favorite vanilla ice cream, let it slightly melt, then add in some raspberries, sliced, strawberries, blueberries, and blackberries. Wash and dry the berries (you can use all the berries or just one red berry and one blue berry), and mix in with the semi-melted ice cream. Refreeze the delicious concoction, and scoop onto Cheryl’s Happy Face Cut Out Cookies—which are sure to match your smile when you dig right in! Nothing says summertime like a cooler filled with cheery frozen treats like these DIY toppings cups! Stock up on plastic mason jars—broken glass will put a damper on the occasion—and fill each with a scoop of ice cream. Dress each one up with some favorite toppings, like sprinkles, shredded coconut, crushed macadamia nuts, dark chocolate chips, or small pieces of tropical fruit (such as mango or pineapple). Stash in the freezer until you’re ready to go, and then surround with ice packs to preserve at the picnic. If you’re taking it up a notch and serving a nice, outdoor dinner, give your dessert a special treatment too with a brownie a la mode. 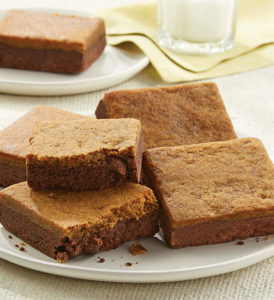 Skip the oven for this show-stopping dish, and order up an assortment of caramel fudge, frosted chocolate, blondie, and more in Cheryl’s Create Your Own Brownie Box. Top with a scoop of decadent dark chocolate ice cream to take the dessert to the next level. If you’re feeling adventurous (for adults only), add a drizzle of liqueur or a grappa-macerated cherry. A summertime barbecue isn’t complete without some pie, right? Shake things up a bit by crumbling a quarter of your favorite berry pie into a quart of slightly melted raspberry, cherry, or vanilla ice cream. Stir the concoction to combine, refreeze, and scoop into ice cream sundae glasses. 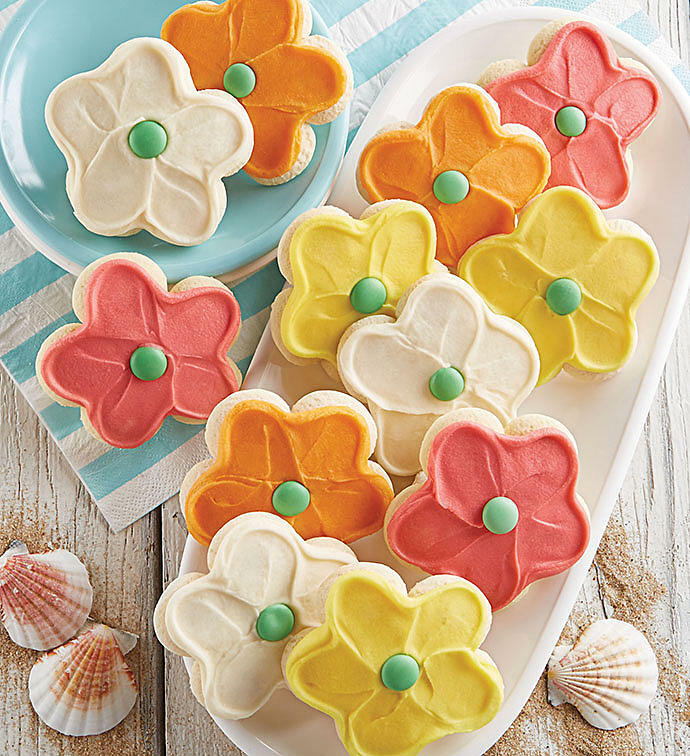 To give your dessert an even more summery look, top with a pretty Buttercream Frosted Flower Cut-Out Cookie from Cheryl’s.